Chinese embedded CPU provider Ingenic Semiconductor has unveiled a MIPS-based developer board that can be used to create wearable, healthcare and industrial devices that include a wide range of environmental sensors and wireless communications interfaces. 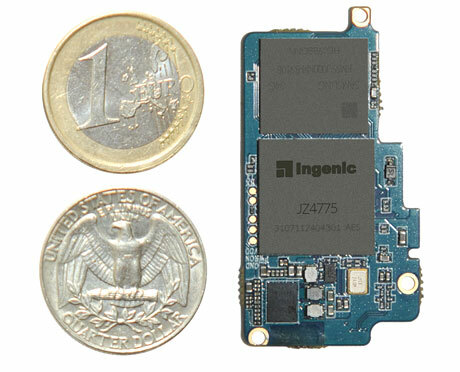 The Ingenic Newton is a single board similar in size to an SD card. It includes a MIPS CPU and memory plus a humidity and temperature module; a three axis gyroscope, accelerometer and magnetometer; an ECG bio-sensor; and a 4-in-1 wireless module that supports WiFi, Bluetooth 4.0 and BLE, FM radio and NFC. The platform supports both Android and Linux. “The three-axis gyroscope, accelerometer [and] magnetometer can track your movement and help the CPU compute how many miles you’ve walked, for example,” MIPS technology owner Imagination Technologies has told NFC World.